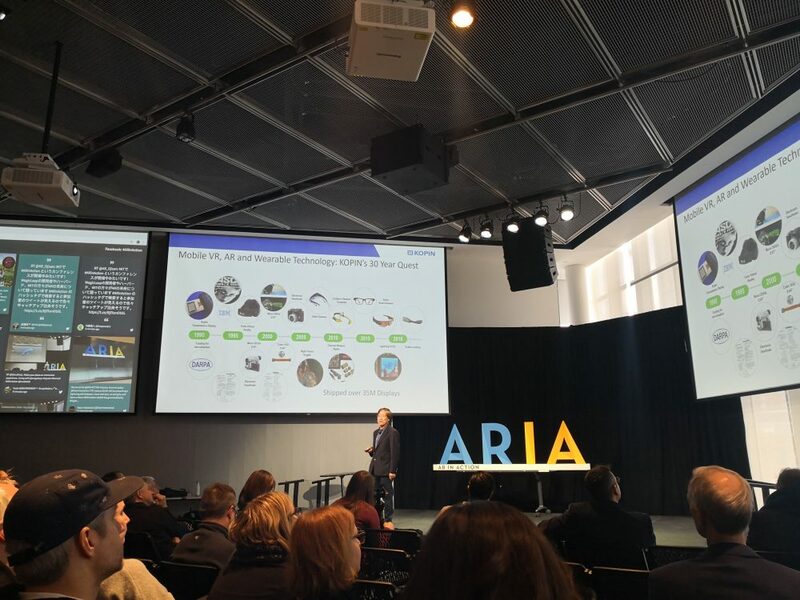 ARIA stands for Augmented Reality in Action and is a leadership summit held yearly at the MIT Media Lab. The summit is sponsored by Kopin, a leader in wearable display solutions that has been in the market for over 30 years. Kopin is known for making the $400,000 helmet that F-35 pilots wear and also offers a vast array of enterprise wearable display and microphone solutions. Whereas VR, or virtual reality has gotten immense hype, AR is often seen as the forgotten stepchild of the field or is even used interchangeably with VR! This is why ARIA came about as a way to showcase innovative augmented reality solutions that are currently under development as well as those already in the market. 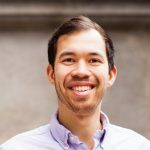 The summit featured talks from industry leaders from companies such as Google, PTC, Magic Leap, Bose, and Kopin, while also showcasing work from educational institutions such as MIT and Harvard. In the keynote speech, Kopin CEO and Chairman Dr. John C.C. Fan spoke about five core rules for creating successful wearable AR experiences. In the next few paragraphs I will highlight these rules and showcase several companies who are following these principles that were present at the summit. Successful wearable AR products must be able to solve for the question, “why should I wear this?”. Adoption of new devices can only happen if a consumer is willing to wear the device. It must be comfortable; it must be fashionable. Without these drivers, innovations won’t be accepted. While Google Glass was a great example of a product that was designed for comfort in mind, it was not fashionable at the time. One could argue that Google simply miss-timed the release of their device, as now wearable AR devices are becoming more and more in style. Google X’s Jay Kothari gave a talk on how Google Glass has evolved over time and what current use cases the technology is still being used for. There are countless demos / mockups out there that showcase the power of AR and they all seem to cram as much information as possible onto a display. Augmenting our reality does not mean overtaking the reality one is in, and a product must have that in mind. Kopin showcased its Solos smart glasses for cycling as an example of Rule 2. As cyclists are often elite athletes, they will have a good idea of what stats they want on their display and can customize their experience to their liking. The glasses will only show the most important information to a cyclist. This way they have fewer distractions and can still focus on their physical surroundings. As humans we want to always be aware of our surroundings. We like to see, hear, touch, smell, and taste things around us. Buildings products that keep our sense of awareness intact is important and sets up certain design criteria that should be followed. Sight and sound are the most important of these two and should define how we interact with augmented reality. See the above example again as a reference. In our physical world our voice is the most important way to communicate. While we have been using the mouse and keyboard for many years, they have been compromises to our true communication capabilities. Thus, focusing on voice as the channel for communication in AR is key. Spatial is a company that has burst out of stealth mode recently who showcased their vision of AR to create a better collaboration tool at ARIA. Spatial transforms any work-space into a shared augmented reality where people can communicate, brainstorm, and collaborate on ideas using shared walls and other visual aids. While Spatial still uses laptops and smartphones as part of the collaboration effort, it also has an emphasis on voice / voice commands. Just like in the actual physical world, the AR world should integrate voice as a primary tool of communication and engagement. In any product, there needs to be a trade-off between the design, the functionality, and the aesthetic look. Over-designing a product with unnecessary features will not lead to customer uptake. There should be specific benefits that motivate people to adopt an AR product which they will willingly use for extended periods of time. For example, most people do not think of Bose as an AR company. However, one could argue that they have been in the AR business for a long time already. Augmented reality does not just stop at voice or sight; hearing is another sense that can be augmented. This is where Bose has come out with a new “hearable” device called Bose Frames which were presented at ARIA. These sunglasses come with head movement sensors, speakers, and a microphone to take calls. The frames are both stylish and functional and don’t over promise on their benefits. The glasses protect your eyes and the speakers allow you to listen to music. The hearable AR space is largely nascent, but Bose is already thinking of using the Frames as a way to explore cities better through tracking head movements combined with GPS to give users accurate information on buildings, streets, monuments that are right before their eyes. While there are several more AR use cases promised in the future (games, fitness, travel), the Bose Frames have done an excellent job at balancing design with benefits. These five rules focused on wearable AR products, however the lessons can be applied to AR applications as a whole. AR can have powerful implications on future developments in education, medicine, journalism, and even analytics. However, the design of the product and the benefits the solution will bring must always be seen in the context of our own reality and how it fits into our own world. Keeping this in mind will help drive adoption and user uptake as well as push the boundaries of AR forward in the future.